The burdens of life and the support of a son for his suffering mother fuse in Michelangelo’s final sculpture, the Rondanini Pieta. It is believed that Buonarotti began work on this final pieta in the mid-1550’s, not long after he first brought chisel to stone on what is known as the Bandini Pieta. While that work resides in Michelangelo’s city of Florence (in the Museo del Opera del Duomo), the Rondanini occupies a special space in Milan’s Castello Sforzesco. The Pieta is named after the Palazzo Rondanini in Rome, where the sculpture stood for many years. In the Rondanini, the master portrays in a most intimate and telling way, acceptance of his mortality and the unique bond between mother and son. The master lost his mother when he was but six years old. That early loss significantly affected his later work, with the portrayal of a mother who has lost her son particularly moving in this final sculpture. 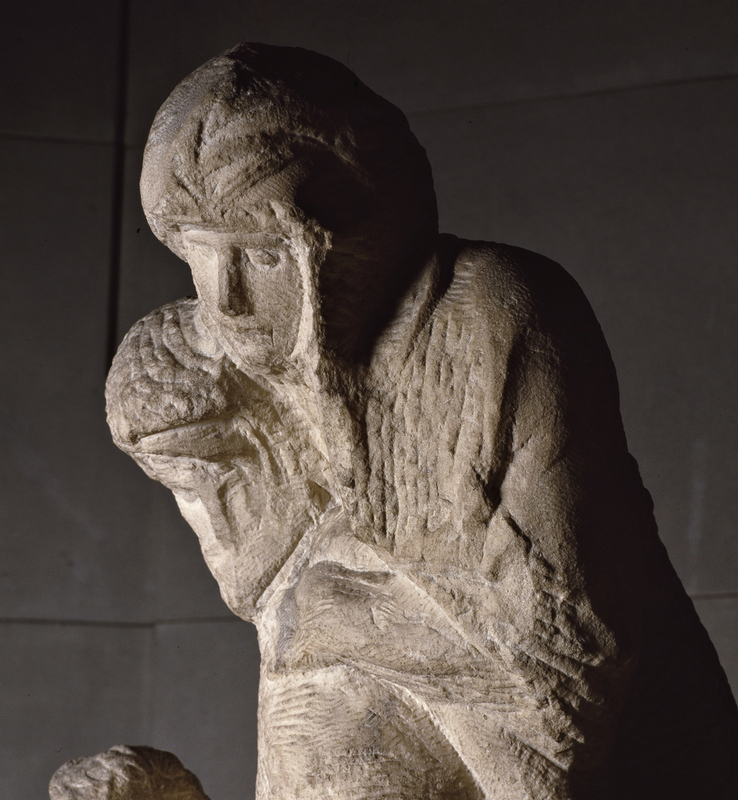 When viewed from the side, the position of the two figures seems to show Christ supporting this mother. 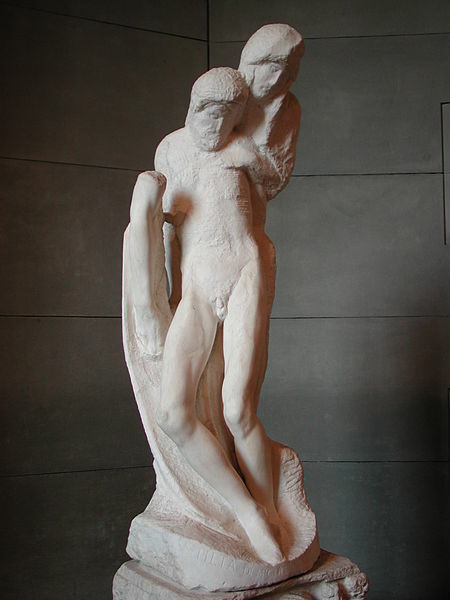 Perhaps it was Michelangelo’s intent to portray the son’s understanding of his mother’s suffering upon his death: he wished to support his mother in her grief. It is, from any angle, a stunning and moving final work by a very long lived Tuscan master. The work of Buonarotti, particularly this final pieta, seem to me an influence on the work of Alberto Giacometti, a Swiss sculptor. He was born in 1901 into a family whose father was a famous post-impressionist painter. Alberto’s talents in art were evidenced at an early age and, after studying in Paris with a student of Auguste Rodin, he established himself as a power in the modernist movement. The elongated limbs, the poise of the woman (in this case, below) seem to have found inspiration in Michelangelo’s last pieta: stretched arms, a certain sadness, a nearly sensual texture and a common peace in both the Rondanini and Giacometti’s work. The beauty of Michelangelo’s work underscores the impact his sculpture has had on the world of art. Whether or not Giacometti ever even saw the Rondanini in person, and whether he was in any way influenced by Michelangelo’s work, will remain a mystery. 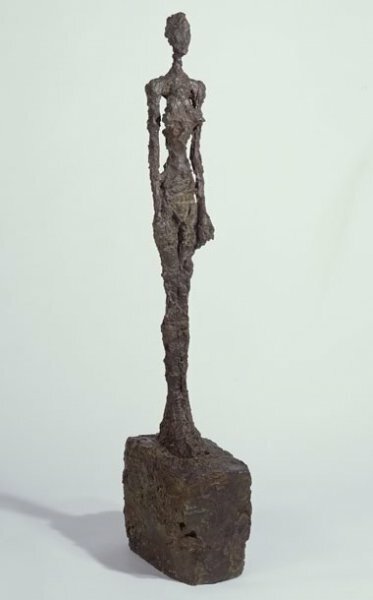 Giacometti’s stunning interpretation of the human figure, I believe, echoes very strongly the style and genius of Buonarotti’s final pieta. Closed on the following holidays: 25 December, 1 January, 1 May, Mondays and Easter.